The final high-rise tower in the Windsor Gate master planned Coquitlam community by Polygon is coming this Spring 2017! Mantyla at Windsor Gate Coquitlam features apartment residences located in an enviable location, minutes away from the new Evergreen SkyTrain Line. The Centre of Attention! 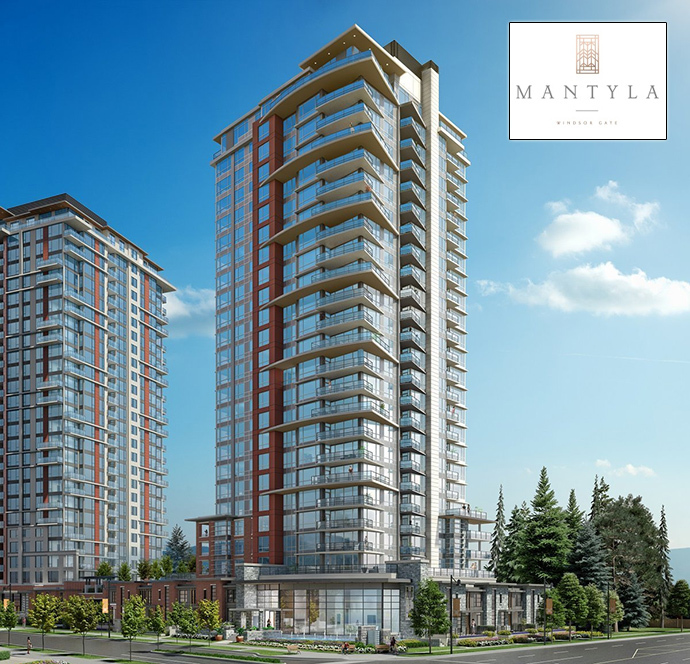 Mantyla Coquitlam condos is the final collection of apartment residences within Windsor Gate, Polygon’s vibrant master planned community in the heart of central Coquitlam. Experience sophisticated two and three bedroom homes and a private, five star clubhouse within Coquitlam’s most sought after community. Outside, a range of amenities await – from top rated schools and the new Evergreen SkyTrain extension, to scenic Lafarge Lake and Coquitlam Centre. For more details, please register your interest at the top of this page. The architecture of the Mantyla high-rise is inspired by Frank Llloyd Wright and will include dramatic overhangs, brick and granite details as well as striking light fixtures. The entrance area will feature an elegant water feature with a waterfall edge and there will be lush landscaping throughout the common grounds. The double height lobby will feature stylish seating areas and a custom fireplace to welcome you home. As part of the master-planned Windsor Gate Coquitlam community by Polygon, Mantyla residents can enjoy the use of the Nakoma Club that features over 18,000 square feet of indoor and outdoor resort style amenities. There is a fitness studio (air conditioned of course) in addition to a large landscaped terrace that is shared by neighbouring Lloyd condo tower, in addition to family style dining areas, a covered BBQ area, seating and walkways. The Nakoma Club at Windsor Gate also has a social lounge with comfortable seating and a television. There is a resident manager on-site in addition to exclusive key fob access to underground parking and common areas. There is also elevator secure l ock-off control access to each floor for added security. 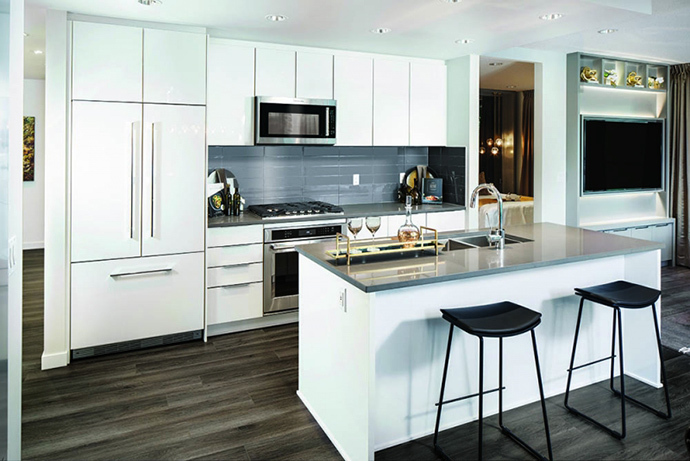 The Mantyla Coquitlam condos also feature underground parking, wireless security system for all podium level and city homes in addition to the Travelers Canada home warranty. Your new signature home will come with two designer selected colour schemes that are called Dark and White. The homes will have contemporary solid wood stained doors as well as modern square panel design interior doors, all with polished chrome lever handles. The main living areas will feature beautiful sleek wood laminate floors with over height ceilings and the bedrooms feature nylon plush carpeting that are very durable and soft. 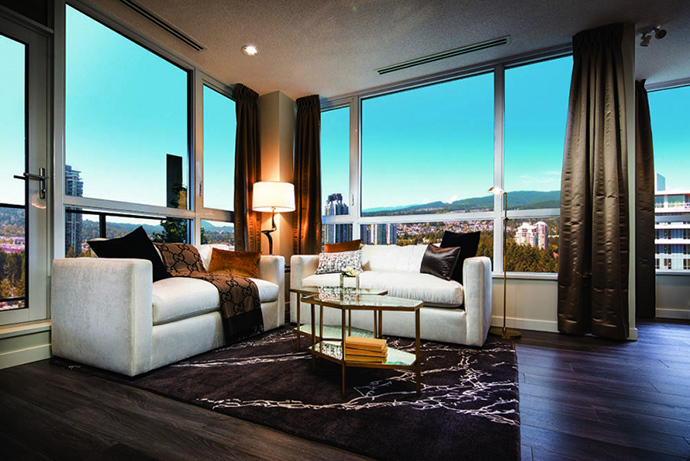 All homes at the Windsor Gate Mantyla Coquitlam condos have low E windows and spacious outdoor entertainment areas. The spa inspired bathrooms will feature deep soaker tubs and oversized spa style showers with frameless glass shower doors, rainshower head in ensuites, built in niche and integrated bench seating in select homes. There’s also polished engineered stone counters and large format porcelain tiled floors. Oversized vanity mirror with recessed lighting and flat panel floating cabinetry are other bathroom features. The Mantyla Coquitlam condos also feature high-end kitchens with superior stainless steel appliances (included are 30” wide KitchenAid 5 burner gas cooktop and self cleaning wall oven, KitchenAid over the range microwave with space saving hood fan, energy efficient touch controlled KitchenAid dishwasher (integrated) and 36” Fisher & Paykel fridge with ice maker and French Doors. There are double bowl under mount sinks and soft close cabinets, sleek under cabinetry lighting, built in recycling bin, polished engineered stone counters, contemporary flat panel custom cabinetry and well designed and functional kitchen spaces. Some exceptional details include side-by-side washer and dryer, multi-USB port in every kitchen, TV outlets and telephone jacks located where you need them, high-speed internet pre-wiring and dedicated dog washing room. Exclusive presale Coquitlam Mantyla penthouses will include Bosch stainless steel appliance package, spa ensuite bathrooms with frameless glass shower doors and thermostatic shower diverter with want. There’s also an electric fireplace with custom mantel surround, air conditioning and convenient hose bib and BBQ outlet on patios for the Mantyla penthouses in Coquitlam’s Windsor Gate community. The Mantyla City Homes come with streetside front door private access in addition to two level floor plans with nine foot ceilings in the main areas. The City Homes at Mantyla also come with large patios off the kitchen with BBQ outlet, hose bib and lighting. The floor plans also have powder rooms on the main floor and wireless security systems for added security. 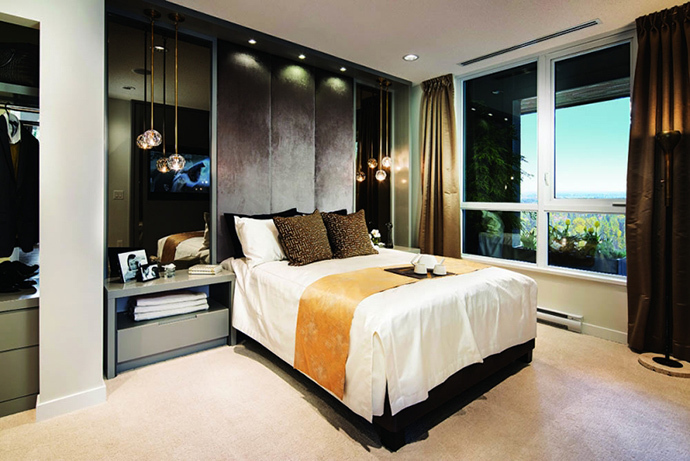 For more information about the presale Coquitlam Mantyla at Windsor Gate condos, please visit www.polyhomes.com today.